The flag of the State of Rhode Island and Providence Plantations as it presently exists was formally adopted by the General Assembly at the January Session of 1897. 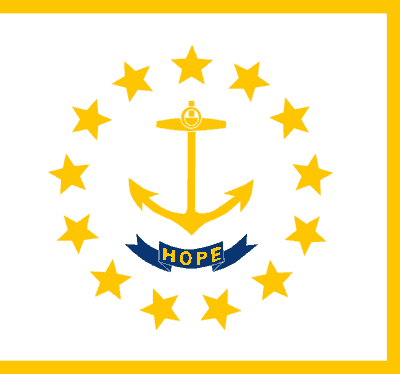 The flag of the state of Rhode Island and Providence Plantations is white and consists of a gold anchor in the center (a symbol for hope) surrounded by thirteen gold stars (for the original 13 colonies and Rhode Island's status as the 13th state to ratify the Constitution). A blue ribbon below the anchor bears the state's motto in gold: "HOPE." 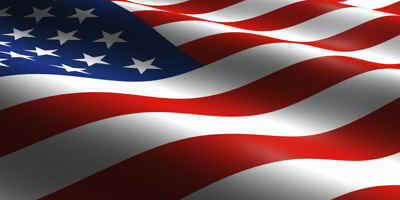 The flag is frequently depicted with golden fringe around the edges of the flag. 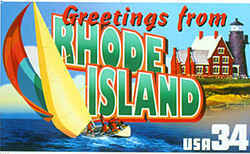 Rhode Island was the third of the original thirteen colonies to formally adopt a State Flag, New Jersey and New York having done so in 1896. Although of such recent origin it incorporates all the features which from time to time have been prescribed by the General Assembly. The colors, white and blue, are the same as those used in the flags carried by the regiments of the State of Rhode Island during the American Revolution, the War of 1812 and the Mexican War. 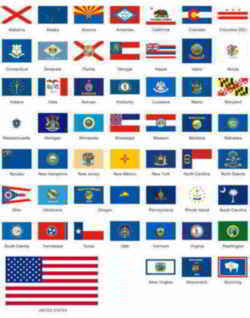 The stars which represent the thirteen original states were also used on flags of the Continental Regiments from Rhode Island during the Revolution. The anchor has been connected with Rhode Island since its foundation. As early as the 1640s, the anchor and "hope" were found on the Rhode Island Seal, and the seal's words and emblems were likely inspired by the biblical phrase "hope we have as an anchor of the soul," found in Hebrews, Verse 6:18-19. 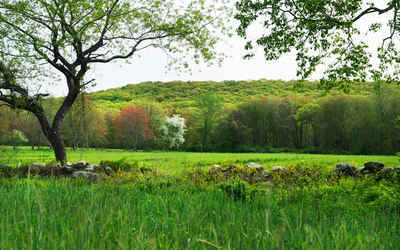 Rhode Island's earliest colonists were fleeing religious persecution in Massachusetts due to their Christian beliefs. In 1647 the Assembly acting under the Cromwellian Patent of 1643 setting up the Providence Plantations adopted the anchor as the seal of the province. In 1644 when a more liberal charter was granted by King Charles II to the Colony of Rhode Island and Providence Plantations, the anchor was again chosen for the seal but the word "Hope" was added over the head of the anchor. "I pledge allegiance to our State Flag, and to the Republic of which Rhode Island forms a part; one Union inseparable, with honor and reverence for both State and Nation." State of Rhode Island General Laws, Title 42, Chapter 4. § 42-4-3 State flag. --The flag of the state shall be white, five feet and six inches (5'6") fly and four feet and ten inches (4'10") deep on the pike, bearing on each side in the center a gold anchor, twenty-two inches (22") high, and underneath it a blue ribbon twenty-four inches (24") long and five inches (5") wide, or in these proportions, with the motto "Hope" in golden letters thereon, the whole surrounded by thirteen (13) golden stars in a circle. The flag shall be edged with yellow fringe. The pike shall be surmounted by a spearhead and the length of the pike shall be nine feet (9'), not including the spearhead.